As America gears up for a solar eclipse later this month, from Chiquita comes the funniest piece of Eclipse-themed marketing we've seen so far. The banana brand is launching a campaign encouraging everyone to view the "Banana Sun" on August 21 -- the idea being that it's going to "move the moon in between the earth and the sun and, for two glorious moments before and after the total eclipse, turn the burning ball of gas in the center of our solar system into a giant banana." The brand, and agency Wieden & Kennedy, have teamed up with Funny or Die for the campaign, which includes the hilarious video seen here, a Banana Sun website, a "livestream" of the Banana Sun via Facebook, and from Aug. 14, a Chiquita chatbot on Facebook Messenger to tell fans the exact time to look for the banana sun based on where they live. 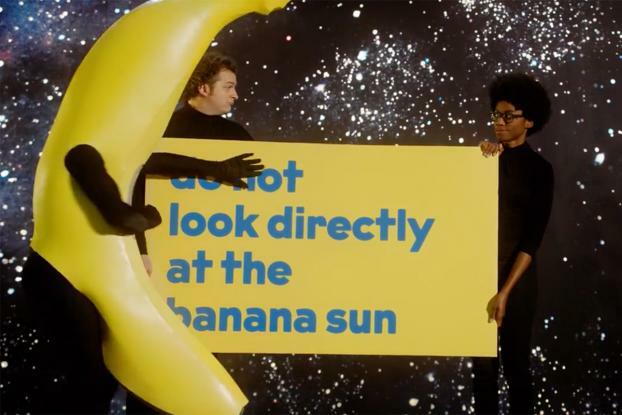 There's also the "Big Banana," a glowing OOH installation near the Flatiron Building in NYC that will debut on Aug. 20, where Chiquita will hand out banana-shaped eclipse-viewing glasses (you can also get them online). Silliness aside, the best thing about the campaign is how it satirizes eclipse fever, from the hilarious FAQs on the website ("What if it's cloudy and I can't see the banana sun?" "If the banana sun is obscured by inclement weather, we will reschedule it for June 10, 2021") to the repeated announcements in the video to not the stare directly at the big banana.